How to calculate total current and power consumption from device? I have a circuit/device that using ESP32 as microcontroller. I want to calculate how much total current and power that my device drawn. The total current drawn in 1 minute by my device is 1.62 A (i just summing all of current draw * time), is it correct? How long my device last if i powered it with battery 4000 mAh, device is using 5 V, and ON/active time is 12 hours a day? 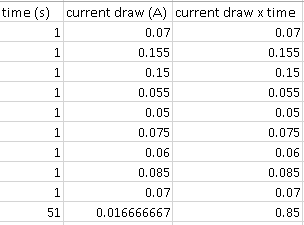 So, to calculate total current drawn i just have to multiple current draw with period, is it correct? As you said before, the device is only ON 12 hours a day, that's 50%, so your final average consumption is 12.25mA. with K = 0.7 battery life is around 228 hours or less than 10 days. As @elliot-alderson states, if you measure every second you could be losing peaks of current in your device/micro, for example, if there is a certain activity with a milliseconds period (ADC sampling, comms, etc.). As @mcg mentioned, for calculating an estimated life, you need to figure out an average consumption, this is the average consumption on a period of time equal to a repeatable cycle in your application. This is, if you read your ADC each second, transmit via UART each 200ms and blink a led every 2 seconds, you should average your consumption within a 2-second period. Sometimes, if your device is most of the time in sleep mode, an event every 15 seconds or minute, you can use the consumption on sleep mode. in your case, your active ratio is 50% (12 hours a day) so that should be also taken into account. Where are you measuring the current at the battery, after a regulator, on a 3.3V plane. Remember that you need both voltage and current to measure power. So 300mA@5V is the same power than 500mA@3V. Check also the efficiency of power converters (DC-DC, Buck, boost) to get a reliable estimation. No, your method is incorrect. What you need to do is figure out the average current that is being drawn. By that I mean log the current that is being drawn over a certain period of time and find the average. You can then calculate roughly how long your battery is going to last by taking your mAh and dividing it by the average mA drawn. A 9V battery, with a capacity of 600mAh is powering an LED with a series resistor. The total current in the circuit is 10mA. The average current is taken every 1 minute for 10 minutes. Each time it is 10mA. This means the total current is still 10mA. It does not add up. Do calculate how long the LED will be illuminated for, you simply take the 600mAh, and divide it by your average current drawn (in mA). Thus, 600/10 = 60 hours. Of course, this will only give you a rough figure. There are losses throughout that time, so some places, such as HERE will have an extra *0.7 at the end of the equation, thus making your battery life (600/10)*0.7 = 42 hours. This is to account for losses that will inevitably happen during the lifetime of a circuit. Not the answer you're looking for? Browse other questions tagged microcontroller power current or ask your own question. How can I accurately estimate the power consumption of a GPS tracking device? How to calculate power draw per rail, to see if Power Supply can handle the load?